What batch number did you taste? Did you try warming the glass (covered) with your hand? This (batch 12) may be my favourite whisky of all time. Yes, I warmed it with my hands. All these superlative reviews for the Amrut Peated CS and Intermediate Sherry! They are both available nearby but because of my disappointment with the regular Amrut CS bottling I bought a couple years ago, I really hesitate to blind-buy them. @KRB80 They are both impressive whiskies. The Amrut Intermediate Sherry is a very gentle one. You will like it instantly if you like sherry bombs. Amrut Peated Cask Strength is a different animal. It takes time to get accustomed to its aggressive and raw character. If you do, you will find out it is a brilliant whisky. 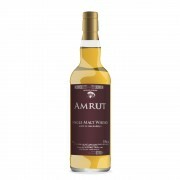 Lots of my whisky friends like Amrut Peated Cask Strength nowadays. Some like it even more than the usual suspects from Islay.